Early on May 7, the day following Oklahoma City University’s graduation ceremonies, a handful of dedicated students, faculty, and staff gathered in the ticket line at Will Rogers World Airport to embark on a weeklong mission with Methodist Habitat on the island of Eleuthera, Bahamas. Established in the wake of Hurricane Andrew in 1992, that ministry of the Methodist Church of the Caribbean and the Americas continues in its primary mission: rebuilding, repairing, and restoring homes for the needy and elderly. The OCU team included six students and four staff members: Elizabeth Horton-Ware, director of religious life; Adam Ryburn, biology professor; Diana Blackmon, nursing professor; and Charles Neff, director of university-church relations and the team’s leader. On the island, the team met Felicia Bethel, whose home is in the picturesque village of Cupid’s Cay. The aging grandmother of six had been unable to keep up with repairs, especially due to her failing eyesight and grieving the loss of her only son. Dividing into three work teams, the OCU missioners went right to work. They replaced the shingles on the roof, replaced rotting soffits, repaired a room that had water damage, and repainted the entire exterior of the home. Breaks were spent getting to know “Ms. Felicia,” the Bahamian workmen who were assisting, local residents, and the staff of Methodist Habitat. Evenings included fun and devotional time. By week’s end, not only was the house in good repair, but also an incredible sense of community had grown within the team and between the missioners and islanders. This was OCU’s fourth international mission trip since January 2015. Plans are in the works to return to Belize over winter break with as many as 40 people in three teams: construction, nursing, and education. Cost for participants was kept low by a generous grant from the Woodworth Foundation. 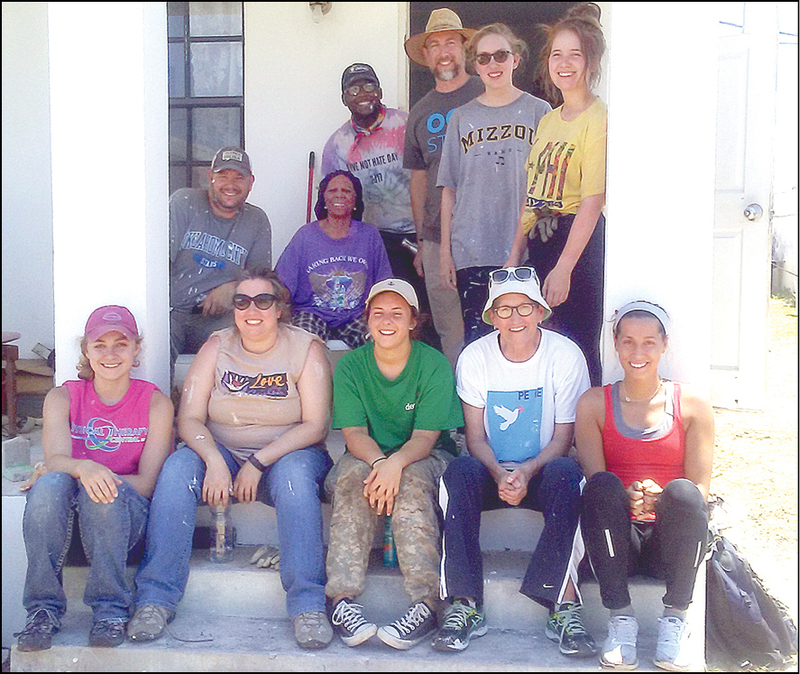 From left: front row, Ivey Lawson, Elizabeth Horton-Ware, Abby Crosswhite, Diana Blackmon, Taylor Horton; back row, Adam Ryburn, homeowner Felicia Bethel, Jay Williams, Charles Neff, Melaina Riley, and Sydney Valaer. 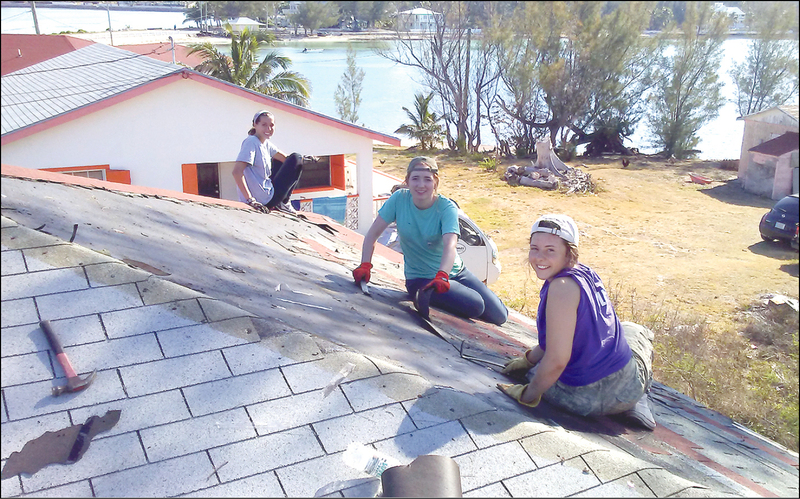 The home of an elderly woman gets its roof replaced by OCU volunteers.